It requires water, either standing pools or humid air. It requires a relatively warm temperature — molds don’t like the freezing cold. It requires a food source. Given proper conditions, mold can grow almost anywhere, indoors or out. Mold spores travel on air currents and are so small (from 3 to 40 microns, much smaller than a human hair) that they are almost impossible to eliminate from the environment. Spores can survive freezing temperatures and dry conditions, only to spring to life when the environment becomes more favorable. Spores germinate and form new mold colonies, which in turn create new spores. 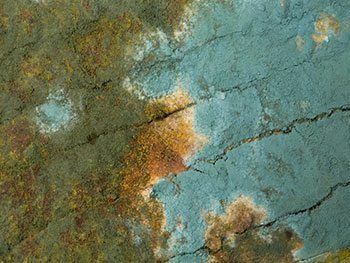 Household mold thrives in moist areas such as bathrooms, kitchens, basements, spaces below leaky roofs or windows, and anywhere water (and water vapor) might accumulate. Molds find bathrooms especially attractive — wet, warm and full of yummy food, from soaps to wallboard to grout. While molds themselves are not poisonous, some varieties (such as Stachybotryschartarum) produce harmful toxins that can trigger numerous health concerns when breathed in. And of course, moldy bathrooms disgust most people, including potential home buyers. A conventionally built house made from wood framing is a potential mold buffet — just add water. Wood studs, paper-backed fiberboard, and many other building materials are rich sources of carbon. The presence of humans, pets, the materials they consume and the wastes they produce only add to the feast. Even if you keep a scrupulously clean bathroom, you might be only inches from mold colonies growing on the inside of walls, fed by leaky pipes, walls that aren’t waterproof, and high levels of moist air. Big, black mold colonies have surprised many a home remodeler during the demolition phase. For example, a bathroom water pipe that drips condensed water onto a wood stud is a non-stop mold party. While you can’t eliminate mold spores, you can easily take steps to put them at a disadvantage. For example, mold doesn’t find steel very tasty. A steel-framed house avoids a primary source of mold food — wood studs. Having said that, even a steel-framed structure can harbor mold, which can grow on pet dander, dust, skin oils and other carbon-containing materials that can settle on steel. The good news here is that when cleaning up mold, you can typically just wipe off the dander and dust that has settled on the steel studs. Cleanup and removal from steel studs and paneling is far easier than cleanup of mold from wood panels and studs due to steel being a less-porous material. This is why a structure, however framed, must be dry and free of leaks. At the same time, the structure must “breathe”– allow moist air to escape and allow dryer air in. In habitually moist climates, the air requires treatment, such as cooling, dehumidifying and filtering. Roofs are another potential breeding ground for mold. Poorly fitted flashing, leaky shingles and nail holes can allow wind-driven rain to penetrate into the attic and encourage our little microbial friends to multiply. One reason metal roofs have gained popularity in the last decade is their resistance to water infiltration and superior structural strength. This can be especially important in locations like Florida, where hurricanes periodically punctuate the humid weather. In extreme cases, mold can compromise the structural integrity of a wood-frame house. Rotting two-by-fours that support roofs, floors and ceilings can collapse, presenting a danger to your person and your wallet. Steel studs and joists are impervious to rot. Mold plays no favorites — it will be happy to destroy the wooden structure of a detached garage, work shed or other storage buildings. A prudent homeowner will make mold inspection a routine chore. Your nose is an important ally — you can sniff out the musty or earthy smell that many molds produce. You can also spot mold growing as dark splotchy patches in wet and humid areas. You might even spot some green mold growing on those leather shoes at the back of your closet. If you use a vinyl wall covering, be on the lookout for pink or yellow stains. These indicate that your gypsum wallboard is rotting. At this point, you probably need professional remedial care. Professionals can identify and measure the extent of the problem and offer solutions to clean out existing mold and prevent a recurrence. Remember, you can avoid wood rot by using steel framing instead, because mold can digest wood but not steel. Another benefit of steel framing: removing a patch of mold from a steel support is a simple matter, but trying to clean the mold out of wood is a tough job and may not be successful in the long run. Select a variable speed air conditioner that is sized properly for the space. An oversized unit is less efficient at removing the humidity. Units rated at SEER 14+ have enhanced moisture removal that is ideal for warm, humid climates. Leave the air conditioner on AUTO, rather than running the fan continuously, which causes the unit to blow humid air back into the structure before the condensed water can drain from the unit and out of your house. Select or build structures made with steel frames and metal roofs. If you don’t have fully ducted air return in each room, keep room doors open when running the air conditioner. Install and use ceiling fans. Keep your home slightly pressurized relative to the outside, so that you are not pulling in warm, humid air. This will require a mechanical ventilation system. For more tips on mold prevention, check out the Florida State Solar Energy Center website. If you want more information about dampness and mold in buildings, visit the site at the Centers for Disease Control.